SEO isn’t as simple as it used to be a decade back, right now it needs immense research and research needs tools. Everyone of us who’s serious about our projects generally have at least couple tools including a link building tool, a website audit tool, a keyword research and finally a rank tracking tool in the list. 5 different basic tools with 5 different pricing plans generally burn a hole in our pockets, that’s where this Serpstat review should come to your rescue. What if you could get a hold of all those and then some under one roof for a fraction of the price? That’s exactly what Serpstat offers. Serpstat features nearly 20+ individual features, I’ll walk you through the most important once in this Serpstat review and present them to you in action and then you can be the judge and jury of the tool’s true potential. Serpstat Review: What is Serpstat? Serpstat is a SEO Tools Package which houses a number of different SEO tools under one roof. Initially developed by Netpeak SEO agency in 2013 which provides it with 5 years of experience today; although it’s been fully independent since 2015. SEO Research basically helps you get a SEO report for your website, it too has a number of sub-divisions which help you research the exact area of your site including Positions, competitors, Domain Vs. Domain, Subdomains, Top Pages etc. For a first-hand experience, I’ll simply key-in “forbes.com” under SEO Research> Positions which shows us all the keywords Forbes is ranking on top for. As you can see, it also shows other important data about the keywords such as their volume in specific countries, CPC, number of results etc. As is evident, the report seems to be pretty detailed with information such as “common keywords” between you and your competitors, missing keywords which indicate the keywords your competitors have but you don’t etc. The exact keywords can be revealed by clicking on those numbers as well! It even offers “Batch Analysis” as one of its features, using it you can compare and contrast between as many as 200 websites in a single click. It brings up extremely detailed insights of all the sites which include traffic, visibility, number of keywords, keywords in PPC, newly indexed keywords, lost keywords etc! As far as the URL analysis feature goes, it simply gets you the URLs of the website you’re researching on with information such as highest ranking URLs, keyword page distribution etc. Although the information is displayed using Charts and Graphs making it “not so boring”. Its Infographic feature is pretty unique, it lets us export all the important data about a site including organic keywords, traffic, competitors etc. as an infographic. Saves us the time to document the data separately, or to make it looks interesting, also making sure the data is accurate without any manual typos or mistakes. Keyword Research is another one of the most important features which warrants a mention in this Serpstat review, it too is divided into SEO Research, PPC Research, Content Marketing and SERP Analysis which are further divided into sub-sections. Starting with the overview, it provides crucial data about a keyword which includes number of searches, competition, CPC, Keyword difficulty etc. Although organic and Ad keywords are displayed as well. Further competitors’ in organic search and those in ads too are listed giving you an eagle’s eye view of sites you’ve got to compete with on either front. The top 10 results in the SERP for that keyword, and the metrics for those sites such as their trust rank, number of backlinks, Referring domains etc. too are displayed letting you feel out the sites. You can further use the “Related Keywords” feature to grab some keywords which are related to your main keyword and still can get you traffic, and probably aren’t as hard as the main keyword. Details shown for the related keywords too are in-depth and include all the metrics such as competition, search volume and CPC. The “Search Suggestions” feature is a user-oriented feature which displays questions and/or keywords which humans actually search for, such as “What is SEO”? “Can we do SEO without Backlinks”? etc. Basically the keywords which most SEOs ignore or don’t get access to. The Competitors section lists out all the top sites which are ranking for the keyword you’ve keyed-in. It also has a PPC Research feature under Keyword research which gathers and displays data about PPC keywords and campaigns run by your competitors, here are the PPC campaigns being run for the keyword “SEO” and data related to the campaigns. Ad Examples gets us ad-snippets as they appear in Google. And Content Marketing displays search questions which are basically question based queries searched by users and their metrics, grouped under “How”, “what” “do” etc. 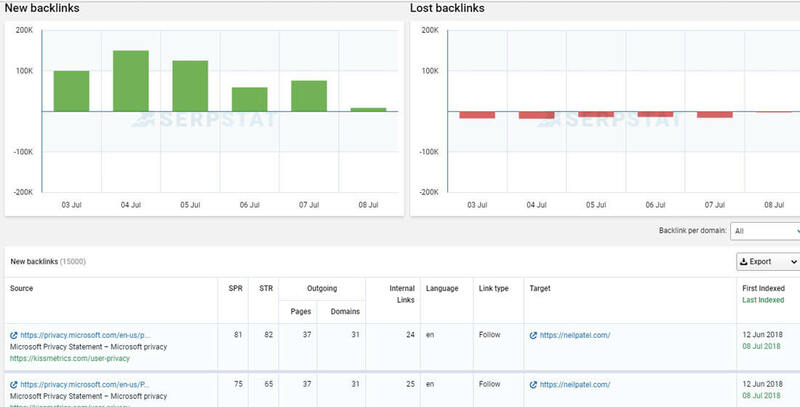 Moving on to my personal favourite feature and section of this Serpstat review- Backlinks Analysis. It’s divided into Backlink Dashboard, Referring Domains, Referring Pages, Anchor texts and pages! The Backlink dashboard is basically like the overview, where you get just about every piece of data required when researching about a site’s backlinks. Here I’m extracting the backlinks for NeilPatel.com, and to be honest the data presentation is overwhelming. It lists the number of referring domains, Referring pages, total indexed backlinks, Referring IPs, Referring subnets, and even backlink types such as .edu / .gov etc. Then the number of New Vs. Old backlinks is displayed in a chart followed by another graph for the anchor texts used by the site, with the number of times the anchor has appeared in the backlinks. A more detailed report about the Referring domains can be obtained by clicking on the “Referring domains” tab under Backlink Analysis. It lists all the domains which have linked to the site along with the exact number of referring pages. Furthermore, the Referring Pages section can be used to gather data about the exact pages which have linked to the site you’ve entered, along with graphical display for New Vs. Lost backlinks. Advanced data such as link-type, number of internal links, first indexed Vs. Last indexed dates etc. And finally, the Anchors tab lists all the individual anchor texts the site has in its backlinks, along with the number of Referring domains for that anchor text, and type of link (nofollow/dofollow). It also has a “Top Pages” section which shows the most backlink-rich pages for the site, which includes the number of RDs and RPs for the page along with the number of internal links on the page. In a nutshell, in my personal opinion, the Backlinks section doesn’t seem to be missing anything and is pretty data-rich even when compared to some other Backlink-only tools. The next section of this Serpstat review involves the Rank Tracker! Rank Tracker is another one of the weapons no SEO Ninja can live without; although individually it’s quite expensive it too is bundled for free in the Serpstat package. It’s divided into Positions, History, Competitors and Landing page. You can create projects with the sites you wish to monitor, and the Rank tracker constantly keeps a watch on the site(s) you’ve specified. Its advanced settings let you specify filters such as Search Engine, device, country, region, and obviously keywords and the tool only tracks changes which fit the metrics you’ve specified. You also can choose the frequency of the tracking, it can be either set to crawl the rankings every day, every 3 days or once a week! Another advanced feature that should be mentioned in this Serpstat review is that it lets you add multiple users to the project so your teammates too may monitor the changes and act accordingly, it has a hierarchical distribution which lets you limit the amount of control you wish each user to get. You can either add keywords manually or choose from the auto-suggested keywords which also display the keyword’s searches letting you monitor your competitors for keywords you didn’t know existed! You can also add multiple competitors to the Rank Tracker which shows you not just the changes for your site, but also those of your competitors. Another one of its features is “History” under Rank Tracking, it displays historical data related to the site(s) you’ve entered along with the keywords you’re trying to monitor. Competitors tab too is the same thing as Positions, but it shows the data for your competitors helping you monitor their progress and maybe reverse engineer your way to the top. And finally, the Landing Pages section which I mentioned earlier in this Serpstat review shows you the exact pages /URLs which are ranking for the keywords you’ve entered along with their positions. Now for the final section of this Serpstat review, Site Audits is a tool which provides 3 different types of reports, namely Audit summary, Loading Speed and Custom overview. The Audit Summary basically gets us an eagle’s-eye view of the site’s performance or points which may effect the performance one way or the other. It also includes solutions to potential problems and ways to boost the site overall. So they divide the issues based on the priority-level the issues are of, it also displays a SDO overall score. Although other advanced data such as Server Parameters, HTTPS certificates, Heading, HTTP Stats codes etc. too are displayed along with the description of the errors, and ways to fix them. The Loading Speed report is basically a report of all the factors which impact the site loading speed, which is a major factor when it comes to SERP rankings. It lists the factors along with their status, and solution if any problems are found. This feature has personally helped me save quite a few bucks, while speed optimizers charge hefty sums to speed the sites up, now I pretty much maintain it without anyone’s aid. So I believe this Serpstat review did put forth a brief overview of what the site primarily offers, which I must say is quite a lot, hence it’s natural for us to get the idea of the tool being expensive, but is it really so? Note that the plans differ when it comes to the number of keywords you can track, branded Vs. White label reports, API support and many other factors hence it’s important you check out the details of each plan before making your pick. So that’s a wrap as far as this Serpstat review goes folks! Neutrally speaking from a consumer’s point of view after spending nearly half a year with Serpstat, I’d say it’s one of the best investments I’ve ever made. Well not just because I’m getting a plethora of tools for a fraction of the price, but also because of the time I save by not having to switch between tools which gets me better organization. The tool by itself is pretty feature-rich and eye-pleasing with its graphs and charts as I’ve shown, also the reports obtained via Serpstat when compared to other leading giants in the industry didn’t seem to lack or miss anything, although that’s my personal opinion. Also, note that I’ve only shown the most prominent and important features that the tool offers, there still are quite a handful of features which exist but haven’t been demonstrated in this Serpstat review. Hence I urge you to check the tool out and let me know what you think of it, and also if you think this Serpstat review was helpful do drop your opinion in the comments. 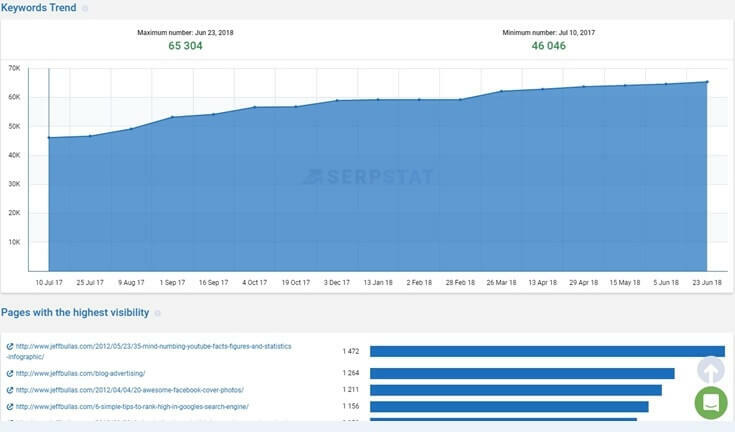 I have used serpstats and it is one of the best SEO tools I have used. Although, Thanks for sharing this amazing review.